Located in the Anuppur District of Madhya Pradesh, Amarkantak lies in the Maikal ranges connecting Satpura and Vindhyachal Mountain Ranges. It is located at the altitude of around 1067m. According to 2001 Census, Amarkantak City has the population of around 7000. Amarkantak is a mystical town which is home of several mythological stories about Narmada, as well as, her father Lord Shiva and is popularly known as ‘Teerthraj’ – ‘the King of Pilgrimages’. Hence, it is literally a religious destination. Being the origin of Johilla, Sone, as well as, the Narmada rivers, Amarkantak in MP has around 12 temples. One of the most important is Narmada Temple. This temple was built by the Bhonsles of Nagpur. The boundary wall of the premises of this temple was built by Maharaja Gulab Singh from Baghel dynasty. The Patleshwar, as well as, Machendranath Temples were built by the Kalchuris. The group of Kama Matha Temples has been declared as conserved site by the Archeological Survey of India. Moderate climate, rich vegetation, picturesque location, as well as, its religious significance attract thousands of tourists and devotees every year in Amarkantak. There is a legend about the construction of this temple. It is said that the goddess Narmada appeared to Rewa Nayak, a banjara or nomad in a dream. The river goddess directed him to clear the site of the present kund. When Rewa Nayak found the spot, it was covered with a dense mass of bamboo trees. He toiled hard, day and night, to clear the site. Once he cleared the site of trees, he found a stream, which was none other than the holy river Narmada. Rewa Nayak installed an image of the goddess in a temple at this spot. His descendants later installed Rewa Nayak’s image in one of the alcoves in the temple. The rivers, Narmada, as well as, Sone originate at Amarkantak. Legend says that the two were to be wed. But Sone rebuffed Narmada and married another. The spurned Narmada was so hurt that she changed her course and began to flow westward! Amarkantak is preliminary known as a religious city. By considering this fact, here are some tourist attractions in Amarkantak, which are ideal for a spiritual journey . Narmadeshwar Temple : The group of temples in itself, Narmada Temple is famous for the origin of Narmada River as it has its holy Kund. In the premises, 20 small temples are located here and each of them has their own importance. One of them is Sati temple of Mata Parvati. Sonmuda : It is a sunrise point and Sone River is originated from here. 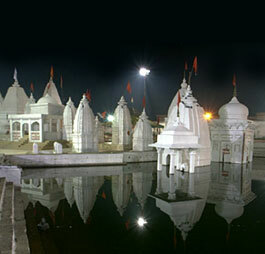 Mai ki Bagiya : It is a garden located around a kilometer away from Narmada Temple. It is densely forested. According to the locals, Narmada Devi herself used to come here to pluck flowers. Bhrigumandal : It is located on the forest trek zone which is 3 km from Amarkantak. It was the meditation spot for Bhrigu Rishi. Chandi, as well as, Parsvinayak Caves are also located here. JwaleshwarMahadev : This temple is located in the dense forest and Johilla River is originated here. A sunset point is located near this temple. Kabir Chabutra : As the name suggests, Sant Kabirwas meditated here. DudhDhara : It is a very sprawling Narmada river’s waterfall around 1 km away from Kapildhara. Kapil Dhara : It is around 8 km away from the source of Narmada River. It is 100 ft. long breathtaking waterfall on Narmada River. It was also the meditation point for Kapil Rishi. DurgaDhara and ShambhuDhara : These stunningly amazing waterfalls are accessed in the dense forests. You have to walk through a few kilometers inside the forest to reach here. Sarvodaya Jain Temple : This under construction temple is known as a construction marvel. In construction of this temple, iron and cement haven’t been used. A 24 ton idol is being placed here. In the radius of 3 km from Amarkantak, all routes are ideal for trekking where you can explore the natural beauty, which is simply breathtaking. Amarkantak records near freezing temperatures in peak winter months like Dec & Jan. The best time to visit Amarkantak is between Sept to March. Nearest airport is at Jabalpur ( JLR ) at a distance of 240 kms & is connected with Mumbai, Delhi,Hyderabad and Bhopal. The nearest railway stations are Anuppur and Pendra Road 43 km via Keonchi and only 28 km via Jwaleshwar. Amarkantak is well connected by regular bus/cab service with Shahdol, Umaria, Jabalpur, Rewa, Bilaspur, Anuppur and Pendra Road. We offer customized & tailor made packages for Amarkantak as per the requirement of the guest.